Are you fascinated by menswear both past and modern? If so, then the menswear exhibit that will soon be on display in Ultimo, Australia’s Powerhouse Museum should certainly be on your radar. The exhibit is called “Reigning Men: Fashion in Menswear, 1715-2015,” so you know it’s going to be good. If a trip to Australia isn’t exactly in your budget, that’s okay. Here’s everything you need to know about this fascinating exhibit. What Is the “Reigning Men: Fashion in Menswear, 1715-2015” Exhibit? The “Reigning Men” exhibit, which is a fun play on words, is one of the latest displays at the Powerhouse Museum. The Powerhouse is actually a branch of Australia’s Museum of Applied Arts & Sciences and regularly features exhibits on science, health, and art. For instance, another exhibit at the Powerhouse is devoted to Australian wedding fashion. 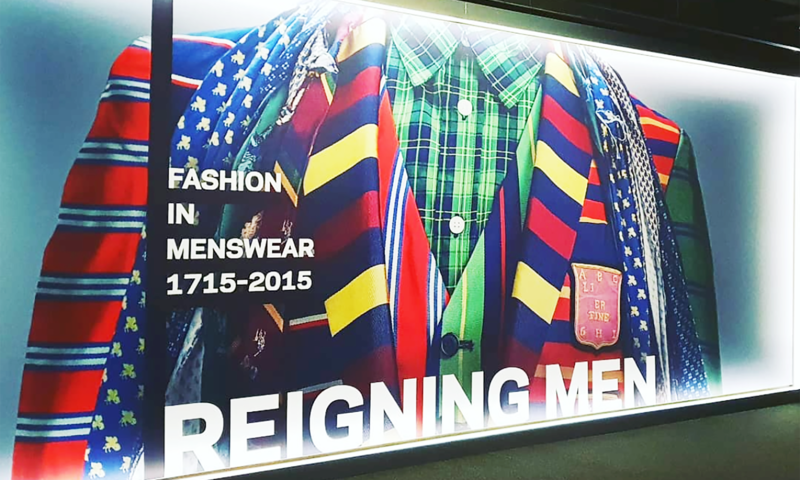 Going back to the “Reigning Men” exhibit, this is a full-coverage display of menswear history. It starts with looks dating back to the 18th century all the way to the past three years. With so many decades covered, there’s tons on display, with more than 100 looks in all. According to the Powerhouse Museum itself, this includes many garments from the Los Angeles County Museum of Art and Martin Kramer (a Switzerland-based fashion dealer), such as those designed by Yves Saint Laurent, Louis Vuitton, Jean Paul Gaultier, Gucci, Giorgio Armani, Chanel, Calvin Klein, Burberry, and Alexander McQueen. There are aristocratic suits worn in the 1770s and 1790s (the 18th century) respectively, London-based dandy suits from the 19th century, and zoot suits that were the norm in the 20th century, specifically the 1930s to 1940s. At the time, these suits were favored by men in Jewish, Latino, and African-American communities. Expect to see more modern fare from the 21st century as well. This includes flowered tuxedos and skinny suits from the above mentioned fashion houses. In all, there are 130 garments on display, so there’s plenty of culture and history to drink in. How Long Is the Exhibit at the Powerhouse Museum? The “Reigning Men: Fashion in Menswear, 1715-2015” exhibit begins on Tuesday, May 2nd and runs through Sunday, October 14th, 2018. That’s a whopping five months, so those who are lucky enough to attend this exhibit may want to come back a second or even a third time to take in the expansive beauty and wonder of men’s fashion history. Header photo by @jomali84 on Instagram.